Oh, Lemonade it is a yummy summer treat. Filled with sugar and all sorts of fake colorings and chemicals has made me say, “No way!” I started to work on slashing calories and chemicals and came up with these great ways to get that lemon taste with out all the sugar or added “extras” from processing. You might need to add a bit of sugar until you adjust to a less sugar filled taste stevia brings, but now that I have adjusted, these recipes are staples during the summer months here. This is a favorite when we have company over. I put honey and lemon juice and sometimes a bit of water in a pan and stir it until it is combined and liquid being careful not to heat it so much that is ruins the enzymes in the honey or lemon juice (sometimes you don’t even need to heat it) This can be lemonade concentrate to freeze for later or you can add more water and stir it well and put in the fridge to chill and serve… Delicious. Tis the season for colds and coughs. I gave up the sugar filled, chemical concoctions sold at most retailers and started making my own a few years ago. This recipe is the one I make for me when I come down with that icky snarfully cold feeling. I wouldn’t give this to little C, but I’ll share below what we do for her below. I also run a diffuser with lots of different essential oils and cut out sugar… Sugar suppresses the immune system. *Warning I am not a doctor or nurse* This is what we do and I am not suggesting that you give up common sense and use this. I assume no liability from use of any recipes on this site. by all means this is not suggested for use with kids…. it is a bit spicy, but it works like a charm for this momma! Take a teaspoon every hour and it it sure clears our your sinuses. My netti pot and this syrup has me feelin fine… now sounding ok… well that is another story, but feeling good is worth something isn’t it?? Kids get coughs and it seams to last forever… What do I do? I give honey. Yes that is right Honey is natural cough suppressant. Sometimes I mix in cinnamon (a little bit) and sometimes I add in lemon juice and sometimes I have elderberry juice that I infuse with clove and cinnamon add to honey. That is little C’s *favorite* cough syrup. Yes it is that simple. My go to kid cough syrup is honey and sometimes *flavored* honey. *most of the time I give a teaspoon of “cough syrup” and then follow it up with a cup of warm tea with more honey added* For some reason Little C enjoys being sick… It must be the honey treatments, movies and snuggles. 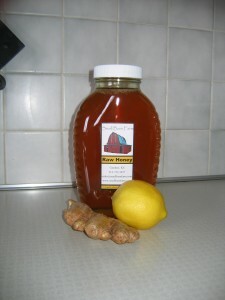 Here is a link to some info from Webmd.com on honey as cough syrup. Let’s talk for a minute about real food. You know foods that have names we can pronounce. The things our great grandparents would have called food. That is what we try to fill our kitchen with. Real food. So lets talk about Maple Syrup. It is hard to find real maple syrup in this area. We aren’t in an area where there are too many sugar maple trees and so a do it yourself maple syrup project isn’t in the picture. I haven’t found a farmer nearby that taps maple trees, so that isn’t an option either. Last time I checked most “maple syrup” from grocery stores is nothing more than flavored High Fructose Corn Syrup posing as real maple syrup. So that is out a buying option. Since real maple syrup is not from around here… it is impossible to source locally. I have a family that loves to put syrup on pancakes…. So how do we solve the problem? Since we tend to have an abundance of honey… I add maple extract to honey. 1/2 teaspoon of extract to 1 cup of honey. Amazing. Seriously. It makes the best topping for pancakes and waffles. It also makes the best fruit dip when you whip into cream cheese for a yummy bagel spread, drizzle it on ice cream. It is a great local little treat… Seriously you will want to lick the spoon. It is that yummy. We spent the morning at K-State’s Innovation kitchen getting licensed to sell honey (as in we can be in a store)! Under Kansas Law selling from the farm and at farmer’s market falls under different rules, but we have had a few small stores inquire about carrying our honey. It has been so sad to turn them away, but now we can say YES. (Insert happy dance). We were even given a tour of the hospitality space at K-State’s Innovation drive location and of the classrooms. What a great little hidden little gem in Olathe. I didn’t even KNOW you could rent a commercial kitchen to use — Let alone have one so close to home. Yet another learning entrepreneurial learning experience! Someone should write book about starting a business… I digress. The staff at K-State is super helpful. My only regret is that I didn’t take pictures to share with you, but they do have a website. There are always regrets though right? So if you ever need a kitchen –This one is really great…. Now I need to work on labeling honey. Did I tell you we bottled ALOT of honey today? Well our berry patch endeavor has begun, a little sooner then anticipated. 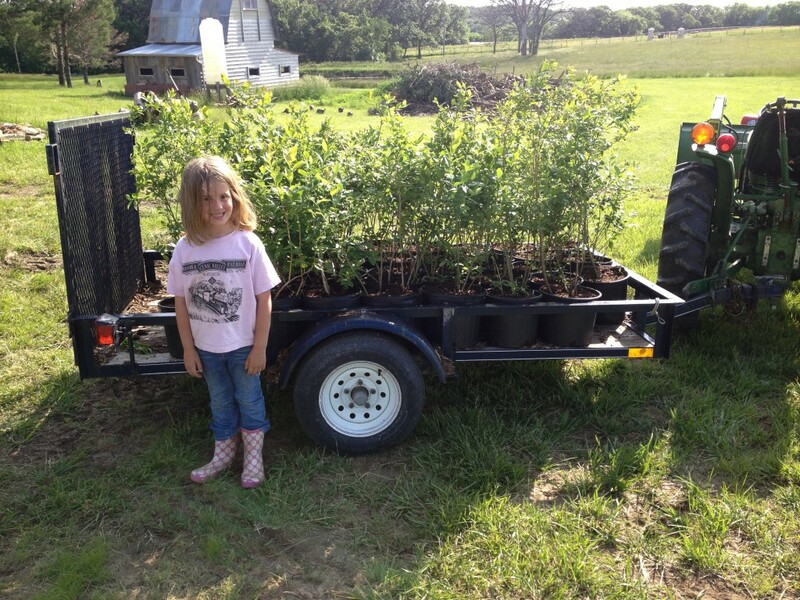 We planted 130 1, 2 and 3 year old blueberry plants from an auction 2 years ago. We have Duke, Bluecrop and Elliott varieties, they are early, middle and late season producers. The 2 and 3 year old plants should be producing fruit next year starting in early June through July, unless we have another summer like we just had — the deer ate every berry before we could pick them. Here is a picture of a few of the plants before we put them in the ground. Isn’t our little helper super cute? Stay tuned for further updates. It is so fun when people visit the market and have great things to say about us! Check out this blog post from Jane M Tucker. Thank-you Jane for such a great post! Do you know about Ebates? I have made some cash this year just from signing up and then visiting Ebates before I buy online. I made $2.70 when I bought a living social deal last week and another $2 when I ordered some vitamins. If you shop on-line, this can give you a little kick back that really adds up to some cash! Obviously $4.70 isn’t much but that was just the last two purchases.